Around a thousand loosely allied protesters between several states recently planned to amass at the Mexican border in order to “block all ports of entry” and send a message to the Obama administration and the Mexican government that they’re fed up with immigration policy. Though the protest was eventually called off due to alleged threats and “suspicious activity” its proposal and response is telling. What the protesters call for is sealing off the border with razor wire, giving border patrol guards the authority to detain and deport immigrants at the border, and an end to all amnesty programs for immigrants. What they really wish to cause is harsher treatment for the impoverished and desperate. This kind of protest is only one example of the large swath of American workers who are vehemently against all but the bare minimum of immigration. A huge percentage of the proletariat in the U.S. are under the impression that immigrants flood in from the southern border to collect welfare checks and take over their jobs. Though the claims may be dubious, the belief in them is not. Is this sort of response warranted? If not, what else can be done to curb the waning number of jobs available? The harsh response to immigration is mainly a class response. In an attempt at self-defense, workers of this country insist upon the deportation of immigrants that they believe will take their jobs, allowing employers to happily lower wages. This is an example of the proletariat being misled into thinking in bourgeois terms, and in terms the bourgeoisie can use to their advantage. No, the people taking your jobs aren’t the multi-billion dollar corporations that cut their workforce or move overseas, it’s a fellow worker looking to avoid poverty. The problem isn’t the bourgeoisie exploiting immigrant labor by paying poverty wages, it’s the person forced to take those wages in order to survive. Because the workers of the United States have been so abused by the ruling class, they look for any means by which to defend their interests, but finding few channels which could collectively be used to change their conditions, they lash out independently, and at whatever is closest at hand. This narrow view of the issue is greatly appreciated and perpetuated in popular media. We cannot look at changing the system that causes the problem or what our collective response could be, we can only look at the individuals who enter the country and our individual jobs that could be threatened. Workers chop wildly at branches while the roots sit happily and cheer them on. The class response against immigrants is a rather strange sort of victory. If big businesses could, they would hire foreign workers to slave away for crumbs in a heartbeat, but the workers defend their wages and benefits in the only way they see possible. The state response of mass deportation and incarceration seems only to be criticized in not going far enough. This strategy is a minimalist one, and an ineffective and inhumane one at that. The hegemonic ideology leads the working class to think in terms of small adjustments, bandages, rather than a treatment of the wound itself. Immigrants come here to share in the wealth of the country, and we’d have more than enough to share if we were to get rid of the parasite class. In fact, the immigrants could not only share in the results of hard work, but help increase them. If we only rise to change the way in which labor works, change it in a way that makes sense to all and can benefit all, we can welcome with open arms our comrades from the global south. Only, the capitalists would have us make enemies of our comrades, they seek to divide us and fight amongst ourselves. To support a nation that is not ours and doesn’t work in our interest. They would threaten us, saying that if we don’t fight the poor we will become poor as well. They make examples of their victims and let us have the final kick to the gut of the people already trampled upon. We’re told to act in their image and follow their example. Their ideas should be our ideas because they’re the only ones that matter, but these ideas are naturally foreign to us. When the working class imitates the owning class it does so without reason. We become marionettes that thrash around in a way that goes against what we collectively experience every day. The classic liberal response to “illegal” immigration was exemplified in the recent crisis wherein Colombian children had entered the country with the government scratching their heads at what to do with them. That response was “maybe the U.S. should stop mistreating and exploiting their country.” While this is all well and good, American influence being what it is in Colombia, this is in no way an answer to the problem. In order for Colombia to reach a point where its citizens choose to stay in the country instead of making the arduous journey towards a better life would require the same upheaval that would make the problem irrelevant. If the United States were to end its aggressive exploitative campaign in Colombia, and send a huge amount of aid, the people would undoubtedly benefit, but this wouldn’t end the long and bloody civil war or the abundance of greedy and corrupt politicians. Nor would it end the drug trade that has claimed the lives of millions. If U.S. corporation were to stop undercutting local businesses by lowering prices along with wages, the Colombian economy would most definitely be better off, but this would only stop the flow of immigration after a very long while. In fact, the increase of wages in underdeveloped countries (until a certain point) tends to increase the amount of emigration because families are now in a better financial position to make the long journey north. So while making conditions better for the citizens of Colombia, or any other third world nation being abused by the U.S., would undoubtedly be beneficial, it’s not an answer to the current problem. So what is? Firstly, the realization that the problem is a false one. Illegal immigration by workers is only a problem under a capitalist economy. Because of the size of the workforce being determined by the possible profit to be made in an industry, instead of full employment to do all the work necessary to be done, too many people available to do the jobs becomes a problem. Imagine you’re painting a fence, and two people come by and ask if they can lend a hand. The logical response is to say “Of course! Your help will make my job easier, and will make the work be finished faster.” By increasing the workers on a project everyone has to work less, and the necessary work can be finished sooner. It’s only when one introduces the profit motive that one’s decision making is suddenly flipped around. Your response is now, “No, you can’t make our jobs easier and faster, I’ll work harder because I need the money I’m getting for painting the fence.” The only way that less people doing the jobs that need to be done in this country makes sense is when an economy is not based upon need, efficiency, or work; but upon profit. Once the middle man of private ownership is removed the economy becomes a matter of work needing to be done and workers ready to do it. Another liberal response is to say that the work taken by immigrants isn’t work that Americans are willing to do because of how back-breakingly difficult it is. Is this supposed to be a good thing? Are we now supposed to let out a breath of relief at the exploitation and degradation of the immigrants? Whether this is true or not is irrelevant. We need better working conditions for all people, and if the work that immigrants are forced to do is so menial and difficult that Americans won’t even consider doing it, we have to find a way to make the job better. The fact that this kind of necessary labor is still so laborious illustrates beautifully that the capitalists are not interested in innovation when it doesn’t affect their profit. Better working conditions will never be and have never been a gift from a benevolent ruling class. 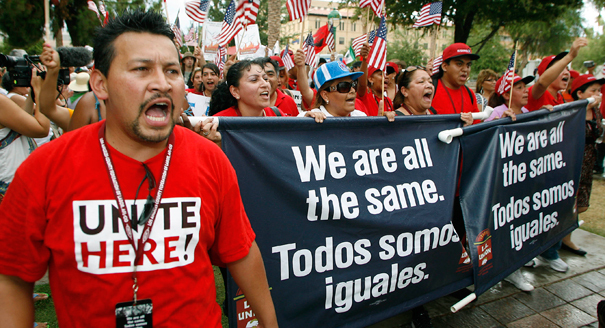 The precarious state of immigrant labor makes it impossible for collective action. To stand up is to be pushed out. Forcing immigrant laborers to live and work in an environment of fear only hurts us. It only makes the low-quality jobs stay low. We should not stop worrying about immigrant labor because of its terrible conditions, we should be worrying about the terrible conditions themselves. We should stop worrying about immigrant labor because they can do the hard jobs alongside us, making them that much easier. It is not the problem of the working class that the bourgeoisie cannot seem to connect people needing work with work needing to be done. It isn’t the fault of immigrants that we don’t have jobs, it’s the fault of a system that can look upon a country where goods need producing, infrastructure needs building and repair, food needs to be grown, etc. and then look upon people willing to produce, build, repair, and grow, and not know how to connect the dots. We don’t need a change in immigration policy, we need a change in economy. We need a radical change if we really intend to protect our jobs and our benefits, because corporations are cutting them and politicians are scaling them back. When we put the decisions about the conditions of our labor into the hands of those who do not labor, those decisions are made with their best interest in mind. When the calloused hands of the working class wrench their work from the smooth and clammy hands of the owners, our worries will be our own. The wealth of a country will be held above its profit, and the happiness and well-being of the people will be our priority, not the health and well-being of a few bank accounts and stock options. We need help with the work ahead of us, and there’s plenty of people willing that are willing and able joining our workforce every day. But who benefits from the immigration crisis? The workers opposing the introduction of immigrants gain nothing, they simply defend the current status of their wages and positions. The policies of the government, no matter how harsh, can guarantee us nothing. Conversely, a few capitalists are raking it in because of the misery of foreign born workers. In just one example, the recent influx of Colombian immigrants held at the border resulted in an increase in the share prices of two of the largest private prison firms, GEO and CCA. The GEO group’s stock has increased by 7%, while Corrections Corporation of America’s has increased by nearly 9%. Proletarian support of harsh immigration policies is the unfortunate result of a strategy of short term goals, while capitalist support comes from the smell of blood in the air. Another group to benefit are smugglers. With human misery comes opportunity, and a great way to make a quick buck is by cramming families in trucks and shipping crates to travel for days on end without air conditioning, restrooms, or any semblance of comfort. Many people die on the way. Also, the immigration process is only a problem for most. If you’re rich enough and own stock in American corporations, you’re in luck. If your brains are helping the dastardly Caribbean island of Cuba (or any other “enemy of America”) you’ll get a free ticket in. The bourgeoisie welcome their class with open arms, but our class is told to keep walking.